Risk aversion dominates in the Asian markets today as recession fears spread. But the currency markets are steady though. Major pairs and crosses are bounded inside Friday’s range at the time of writing, with mild weakest in Sterling and Swiss Franc. After last week’s poor Germany PMI manufacturing, investors will look into Ifo business climate today to gauge overall sentiments in the growth engine in Eurozone. Meanwhile, Brexit drama will resume in the Commons, after campaigns for second referendum gained momentum. Technically, USD/JPY broke 110.35 support, EUR/JPY broke 124.27 support, CAD/JPY broke 82.41 support last week. All suggested near term bullish reversal in Yen. Yen crosses will be watched closely this week to validate this case. Levels to watch include 143.72 in GBP/JPY and 77.44 in AUD/JPY. Also, EUR/CHF’s steep decline last week raised the chance of medium term down trend resumption. Focus will be on 1.1173 low. In Asia, Nikkei is down -3.13%. Hong Kong HSI is down -1.78%. China Shanghai SSE is down -1.37 at 3061, still holding on to 3000 handle. Singapore Strait Times si down 01.39%. Japan 10-year JGB yield is down -0.0114 at -0.084. Chicago Fed President Charles Evans said at a conference in Hong Kong that he now doesn’t expect a rate hike until second half of next year. He noted the US economy is in a strong position. Fed funds rate is seen as close to neutral. And it’s good time to pause and be cautious. Yet, that’s a rather abrupt turn as just back in January, he expected Fed could hike as many as three times this year, assuming the economy remains reasonably strong. Brexit debate will resume in the House of Commons today to find a majority for a way forward that breaks the current impasse. Prime Minister Theresa May said she hopes to hold a vote on her deal again this week. But so far, there is no signs the twice-defeated deal could make a turnaround. Instead, May could unveil plans to hold indicative votes. The push for second referendum gained momentum over the weekend with with over a million people joined the “Put It To The People” March in London. Speakers at the rally included Labour’s deputy leader Tom Watson, Scotland’s First Minister Nicola Sturgeon, London Mayor Sadiq Khan. Separately, the “Revoke Article 50 and remain in the EU” petition now gathered over 5.3M signatures. Meanwhile, the Sunday Times reported that 11 unidentified senior ministers could try to oust May today as she has become a toxic and erratic figure whose judgment has “gone haywire”. Two leading candidate Cabinet Minister David Lidington and Environment Secretary Michael Gove backed May though. Also, it’s reported that hardline Brexiteer including Jacob Rees-Mogg & Iain Duncan Smith demanded May to set a timeline to step done for get their support on the Brexit deal. With short Article 50 extension granted by EU last week, if UK parliament could approve a deal, Brexit is delayed to May 22. If no deal is approved, UK will have to leave with no withdrawal agreement on April 12, or provide an alternative. RBNZ is the only central bank that’s meeting this week. It’s widely expected to keep OCR unchaged at 1.75%. Recent developments have been pretty much in line with the central bank’s expectations. Thus, there is little reason for its to change its monetary stance. RBNZ will very likely reiterate: “We expect to keep the OCR at this level through 2019 and 2020. The direction of our next OCR move could be up or down.” BoJ will provide another central bank activity with release of March meeting summary of opinions. Recession fear is the main theme in the financial markets now. Economic data, in particular from Eurozone, will be closely watched. Germany Ifo business climate, CPI flash retail sales and unemployment will catch most attention. US consumer confidence, personal income and spending will be watched too. Though, US and UK Q4 GDP final will likely be ignroed. Canada GDP is another piece of market moving data. Friday: New Zealand building consent; Japan Tokyo CPI, jobless claims, industrial production, retail sale, housing starts, Australia private sector credit; Germany import price, retail sales, unemployment; Swiss KOF economic barometer; UK Q4 GDP final, current acount, M4 money supply, mortgage approvals; Canada GDP, IPPI and RMPI; US personal income and spending, Chicago PMI, new home sales. Intraday bias in USD/JPY remains on the downside at this point. Prior break of 110.35 support argues that rebound from 104.69 is completed at 112.13 already. 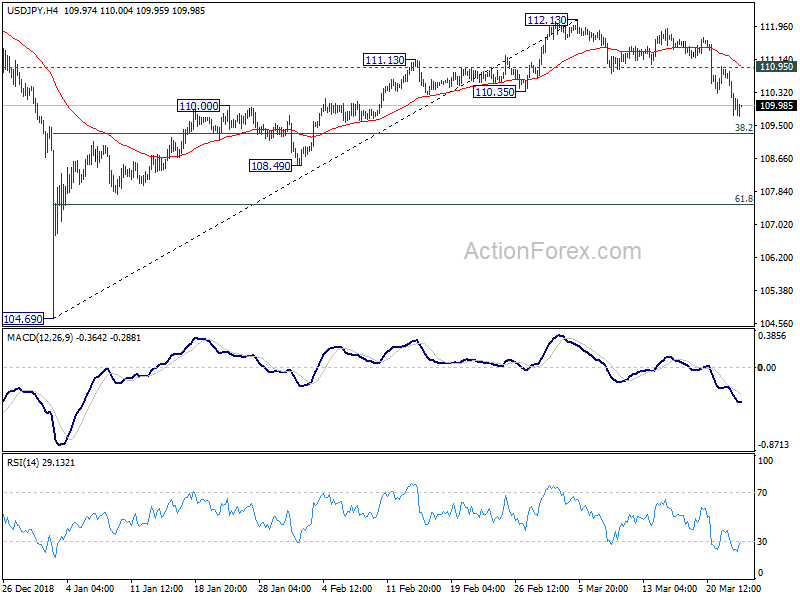 Further decline should be seen to 38.2% retracement of 104.69 to 112.13 at 109.28 first. Break will target 61.8% retracement at 107.53 next. On the upside, break of 110.95 minor resistance will turn bias back to the upside for retesting 112.13 instead. 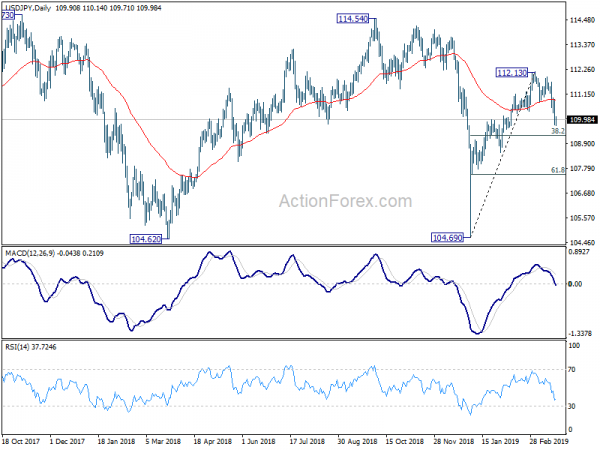 In the bigger picture, while the rebound from 104.69 was strong, USD/JPY failed to sustain above 55 week EMA (now at 110.91), and was kept well below 114.54 resistance. Medium term outlook is turned mixed and we’ll wait for the structure of the fall from 112.13 to unveil to make an assessment later. For now, more range trading is expected between 104.69 and 112.13 first.